If you recall back to Toy Story 2, Jessie was on her way to a really sweet life before Woody got involved. She was going to be a collectible in Japan! How amazing would it be to not only be marveled at by paying guests in a beautiful museum setting, but also live in Japan? Sounds incredible, right? But then Woody came along and put the brakes on the whole thing, which is kind of lame when you think about it. In the end it all worked out, and Jessie found a new owner that loved her. All's well that end's well... but we still think being a collectible would be pretty neat. 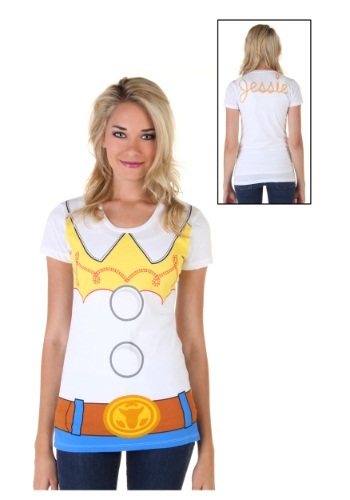 And now you can try giving it a shot with our Toy Story Jessie t-shirt! This officially licensed tee has a graphic print that features Jessie's costume details on the front, along with her name on the back. 100 percent cotton, just add a cowgirl hat, and you'll have a real easy and quick go-to costume. Just don't go anywhere near Al's Toy Barn! Super cute, fits my daughter perfectly. Let me say this. It is all about the sizing with this shirt. After reading previous reviews I knew to order this item larger. I’m 5. 9’ & weigh 145lbs so I usually wear medium to large depending on the fit so I ordered an XL and it fit perfect. I got so many complements.